To be connected is to have a link with another person, many times a link that cannot be broken. 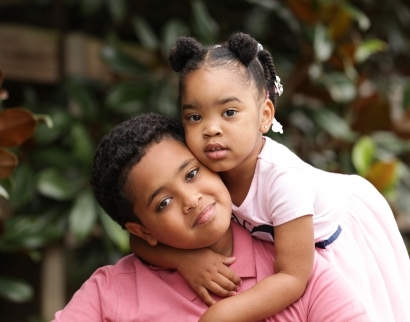 In Hassan and Neva's case, these siblings, despite the age difference, have that unbreakable connection and would love to share it with their forever family. Hassan is a 12 year old young man that is just that, he is a young man. He has a tendency to over think things because he isn't just a little boy, he is Neva's big brother and is used to being the adult. He absolutely adores his little sister and likes to play basketball and build with his hands. Neva is as cute as they come. She truly loves her big brother and enjoys playing dress up as any 2 year old would love to do. Their forever family needs to be composed of a mommy and a daddy for Hassan and Neva. Hassan simply longs to have a mom that wants to do things with him and a dad that will come to his basketball games and show interest in the things he enjoys. These precious kids are still waiting for their forever mom and dad. Are you the ones they are waiting to connect with? Inquire below about making that connection with Neva and Hassan. They need you.